A new business model and revenue approach is going to be essential for college newspapers if they hope to stay relevant and sustainable moving into the second half of this decade. While this may seem self-evident to observers of the general media environment, it is a tough pill to swallow on campus. For years, universities seemed to have been immune from the downturn in newspaper circulation. Even while city newspapers dropped circulation days and laid off staff, college papers appeared to be cruising through the trend unscathed. Sure, national ads dried up, but readers continued to flock to the printed page, and thus the local advertisers also hung tight, keeping inky dead trees a profitable venture. Before I talk about the turn in this trend, let’s look at why college papers continued to thrive, even while city papers limped. It came down to this: environment. The college campus’s physical environment gave the printed page an advantage. First, because of student fee subsidies at most schools, the paper could be distributed free and ubiquitously across campus. Second, the content was relevant and local. The best college papers focused on what they did better than anyone else in the world, and that was to focus on the campus community – a hyper-niche environment that nobody else stood a chance at covering the way the campus natives could. College newspapers had authority on college campuses. None of that has changed. Why then are daily college newspapers now seeing slumping circulation and dropping print days? Again, it comes down to something from the physical environment that used to be its strongest advantage. But if you are a guy sitting by yourself in the middle of the quad reading a newspaper, nobody gives you a second thought. They may even believe that you are an intellectual. Unfortunately for college papers, the smartphone has now replaced the newspaper as the de facto creepy repellant. Much like the newspaper, smart phones also give you the appearance of looking occupied, and thus not creepy. They also feel free because you have already paid for them up front, and everyone has them in their pockets. And what’s worse, social media has made them hyper relevant, taking the thing that the college papers could do better than anyone else in the world and owning it. All of a sudden, picking up the paper is not convenient. It is an extra step. In the quad environment, the newspaper used to be a “push” technology. That is, a publisher could push its content in front of an audience simply because of the nature of the space that audience occupied. The audience was there. The paper was there. That was the one convenient choice. Sadly, now that phones are the more convenient creepy repellant, people have to have a reason to go pick up the paper, making it a “pull” technology. That is, the publisher has to lure, or pull the audience toward the content. College newspapers’ competitive advantage is disappearing – quickly. OK, so now what? Obviously, college papers, like the city papers before them, must innovate to stay relevant and sustainable. The first thing that the newspaper must do is to ensure it is taking advantage of all the ways available to push the content into the audience’s hands. Good PR, street teams handing issues directly to readers, attractive covers: Those are all great ways to keep the printed page alive. But the bigger-picture question is whether that is the best move for the long-term viability of the media company. Sure, this will keep that legacy product alive a bit longer, but a truly innovative manager will see that this life support should only be used as a way of biding time while new products and revenue streams are being actively pursued. To stay relevant, newspapers need to meet the audience where they are. Paper is still relevant, but it is now the niche product. While it is still earning flagship dollars, we need to build the infrastructures for what comes next. Rather than fight against social media, college papers need to step up their game and their presence on those social outlets. Facebook is the new meeting place. It is the new quad. Where before, college newspapers were the authorities on the campus quad, they now need to be the authorities on the social media quad. They need to be producing high-quality content on their websites, and then using their Facebook accounts to pull readers. They need to look at what they do well — better than anyone else in the world, actually — and actively push that content through social media in order to maintain that audience. College newspapers can’t just produce the same 12-inch story and call it a day. The newsrooms need to explore all the ways their audiences are looking to engage in that social space and meet them there with options. Content has to be more than just news. That is because, according to research by Flurry, consumers use their mobile devices to consume news only 2 percent of the time. That is compared with the 17 percent spent on Facebook alone. If we can localize those aspects and provide community-level content, then we can conceivably capture as big a percentage of the mobile usage as Facebook. And once we are sure we can maintain our audience, then we need to apply a revenue model to monetize that audience. Then we’re back in business. There is a truism in systems theory that says that 85 percent of failures within a company are the result of problems with the system itself, and only 15 percent of the problems come down to the people involved. Your employees do know what is expected of them, but they don’t know HOW to do those tasks. Last year I wrote about the case of the “broken car” and why it is wiser to fix the system than to address the symptom. That is precisely what I am talking about here. To illustrate this, let’s draw upon two images that my mentor in the MBA program, Jerry Goolsby, often invokes. The challenge of getting everyone on your team working toward the same goal. First, imagine that these six arrows represent your team. Imagine that the different lengths represent the level of motivation each person has, and imagine the direction it is pointing represents the goal that each team member is aiming to achieve. As you can see, everyone is obviously working to their own end, rather than your desired destination. 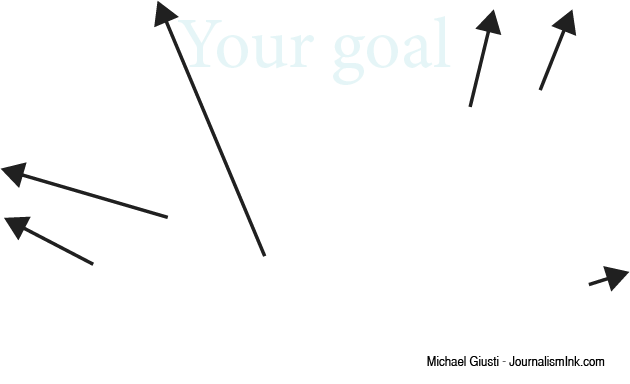 If you as a manager never set a clear, easy-to-visualize goal from the outset, then you are wasting your time increasing your team’s motivation. 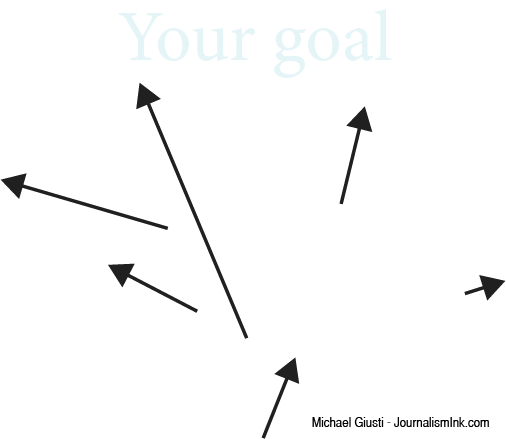 Push each of those arrows as hard as you can and you can see that none of them will ever reach that goal. Even if you do a terrific job motivating someone, if they are pointing in the wrong direction, it just doesn’t matter. It doesn’t matter that YOU know what they are supposed to be doing. If they don’t know that you expect them to reach that goal, even if you are sure that you made it clear, no amount of motivation will get them to do the right thing. The buzzword here is “alignment.” You want to make sure everyone knows where you are trying to go. Rather than starting by trying to “motivate” your workers, instead first make sure they clearly understand what you expect from them. Now, once you have made that goal clear, then you can focus your attention on that motivation. 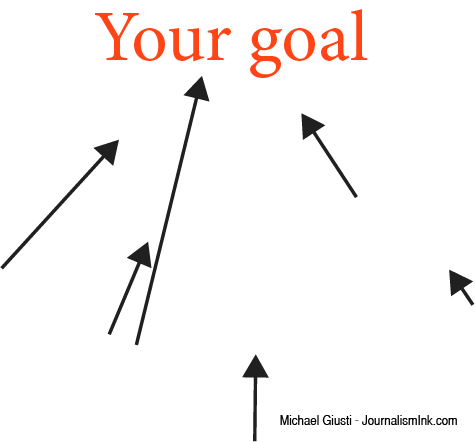 You can start pushing on those arrows, and instead of scattering, they will start moving in the right direction. As for that second bullet point – simply telling someone to do something also isn’t sufficient. You need to break each task down to its elementary pieces. In my newsroom we went through a multi-year process of “decomposing” each of the newsroom jobs to a granular level. We wanted to truly understand the role each position was supposed to play in our system. It took us a while, but boy was it worth it. Now that we have a comprehensive task list for each position, we have written massively detailed work flows and job descriptions that anyone who takes that position can follow. What was a monumental amount of work on the front end is now paying massive dividends in training and in employee satisfaction. There is much less of a feeling that we are just dropping new hires into the deep end without training or orientation. And then we go step by step and re-explain each step to make extra sure that they understand. Yes, I am sure you explained it once. But remember that the first time anyone hears something, the majority of it falls right back out of their ears before soaking into their brain. Sure, in 15 percent of cases, you really are dealing with someone who is willfully trying to game the system. But call me an optimist. I really do think that, at their heart, most people truly want to do a good job — as long as we as managers make a system that lets them succeed. So, next time someone in your newsroom falls flat, step back and ask those two questions: do they truly know what you expect them to do, and do they truly know how to do it. It may just open your eyes. The phoenix cycle plagues newspapers, TV stations, radio stations, yearbooks, magazines — pretty much any student-run media entity. And I would venture to bet that a similar ailment plagues small community newsrooms that have high turnover. Just as the mythical bird does, the media companies grow into beautiful, impressive, powerful and enviable entities. Then, as if out of nowhere, that entity bursts into flames and annihilates itself. All the wonderful work becomes a memory of what was, and the current material just doesn’t live up to that previous standard. Then, after a number of years, another beautiful group crawls from the ashes, and is back to producing wonderful journalism. I spent years studying this puzzling boom-and-bust cycle in college media. I was determined to discover what was driving this cyclical pattern and whether we could design a system to counteract that cycle and smooth out some of those downturns. I worked with several student-run publications at the collegiate level, at the high school level, in private schools and in public schools, and each one suffered from the same cycle. But the puzzling thing to me was that the cyclical curse wasn’t endemic to ALL student media companies. Some of the industry’s shining stars seemed to have gotten that cycle under control. What were they doing that the rest of us hadn’t figured out? It seems to me that this is not so much a symptom of being a college media company as it is the result of some characteristics that many college media companies have in common. Perhaps the most surprising aspect of that list is the strong leader element. But be assured, in every case of the phoenix cycle that I have observed or that I have helped a newsroom recover from, that strong leader element was there. The typical narrative was that the organization had crumbled and so someone, usually an adviser or the strong leader in question, scrambled to fill the staff positions of an organization. Like manna from heaven, a particularly committed group stepped across the threshold and into the organization’s top leadership positions. Everyone breathed a collective sigh of relief. The staff rallied around the strong leader. People were drawn into the organization to work with the strong leader. And the organization performed better than it had performed in recent memory because of the heroic efforts of that strong leader. And then that leader has the audacity to graduate. Without the savior, the organization doesn’t burst into flames – yet. But like a forest without rain, it begins to dry out and set the stage for those flames. Usually it is two years later that something sparks the fire and the phoenix is engulfed. And because irony is cruel, that is about the time that those awards would be rolling in from all that work that the heroic leader inspired. The problem wasn’t that there was a strong leader. The problem was that the organization relied solely on that strong leader, rather than take advantage of that leader’s energy and vision for long-term change. The real heart of the phoenix cycle is the turnover inherent in college media. Best-case scenario, we get to keep our employees for eight semesters. And in most cases, it is more like four or five, depending on when they step into a mature role. Community colleges obviously have it even worse, and the saints who advise those have my eternal admiration. The fires come when more than about a third of the staff leaves at one time. Up to that tipping point, the institutional memory can withstand the shock, provided the rest of the elements I listed above are in order. But even with the best training program and the most professional operation, a 50 percent turnover is going to cripple an organization. I often liken a college media organization to a college sports team. There are a lot of similarities. If you aren’t constantly recruiting and constantly anticipating the holes created when the senior influencers leave, you are bound for disaster. You can’t, and shouldn’t, avoid the turnover. If we do our jobs properly in college media, our best students leave us – they either graduate or find awesome internships or jobs. The trick is to put training and recruitment and professionalization in place to counteract it. Continuing with the sports analogy, you always need a good farm system. If you don’t have a pipeline of solid prospects always flowing into your newsroom, you are doomed to the boom-and-bust cycle. For my newsroom, that pipeline is the journalism program at Loyola. I’m blessed. And this is the case for other strong programs, such as The Reveille at LSU, and the Daily Texan at the University of Texas. I have a strong program from which to draw my recruits, and the classes built into the journalism curriculum serve as a great foundation onto which I can further train. What I don’t have is a built-in pipeline for my business office. Loyola doesn’t have a professional sales major. We do have an advertising degree, but it is focused on the creative end of the field. Our majors want to design ads and be the next Don Draper. They don’t want to do the front-line sales work. I have tried many different methods of keeping my business office staffed up. One of the easy solutions, in the short term, is to bring in an established social group. Bringing a bunch of women from the same sorority, or bringing in a group of friends from the honors program always seems like a brilliant idea. But unless you do that as a stop gap while continuing to do the hard work of building a staff one hire at a time, you are doomed to a phoenix collapse when that group graduates or just gets bored and leaves. The federal work study program: I am an approved work study employer at Loyola and I am always at the job fair publicizing my openings. Established social groups: Places like sororities, the entrepreneurship club, the economics club and the ad team are terrific to find the students who have self-selected as involved. You just need to make sure they aren’t the only people you bring in and that you don’t lean on them for too large a proportion of your staff. What you should NOT do is to show up to a class and pass out a sheet to everyone to “sign up if you are interested.” That always ends up with a sheet of names of people who might be interested, or who might have just signed out of peer pressure. Plus, you can’t differentiate between any of those names – who is going to be a go-getter and who just mails it in. My trick is to show up, give a quick presentation, and then put up a hurdle. I give out my business card and I ask them to come to our next meeting. The ones who actually call and show up are the ones who I want selling for me. When it comes to recruiting, you have to be constantly doing it. Even when you have a full staff, you need to be visiting those clubs and classes and collecting resumes. Getting warm bodies in seats is just the first step in avoiding the phoenix cycle. Properly training them is a whole other thing. And on the surface, that is an admirable effort at training. Hands-on training is certainly one of the best practices coming out of the professional world. The problems come in when bad habits or partially understood pieces of a process come into play. Ed Deming, a 20th century management guru, called this problem “taking a random walk.” If you are interested in the fallacy, this is a nice video called the “Funnel Experiment” explaining the theory behind it. The short version is that on-the-job training is too often a game of telephone — you understood a piece of the message, passed it on as if it were the entire process, and then she understands a smaller piece, until the message being delivered bears no resemblance to the original intent, and the message has taken a random walk off into the wilderness. c) Constantly update that knowledge bank. Every process must be decomposed into its base parts, explained, and then given to a specific person to accomplish. And that has to happen at EVERY transition — any time anyone turns over a position, you need to go through this process. I’m not sure I can say that I have cured the phoenix cycle here at Loyola. What I can say is that we have had the luxury of having four years in a row of very stable, high-performing staff members. We were named to Princeton Review’s list of best college papers this year – a first for our newsroom. So, I do feel good about what we have been doing. That said, I am always looking around the corner for that damned phoenix and hoping I can put out the day-to-day fires before they engulf the whole organization. Can TV continue to be live? NBC’s live showing of “Peter Pan” is more than just a delight to the nation’s children. It might also be signaling the beginning death throes of an industry. The question now is whether that dying industry is the traditional cable companies that deliver TV live, or the companies that produce that content. Although it is common knowledge that printed media are in financial trouble, less commonly known is that network TV’s business model is quickly facing the same issues the newspapers were faced with back in the ‘90s. According to Nielson’s Total Audience Report issued Dec. 3, 2014, viewership of traditional live TV by the typical American adult fell by 12 minutes in 2014 from the previous year. That is a decline of 4 percent. And that is after a similar 2 percent drop from 2012. We are now watching 18 fewer minutes of live TV than we were two years ago. Along with those falling viewership ratings, network TV advertising revenues were also down nearly 4 percent last year. The thing is, total “TV” consumption time didn’t fall. In fact, we are spending more minutes consuming “TV” content than we have in the last few years. So where are those minutes going? It turns out, we are watching more time-shifted TV (which is an industry term to mean we are using digital video recorders such as TiVo to record a show and watch it later.) We are using our DVD/Blue-Rays a bit more. We are using our game consoles to stream video a little more. But the real growth has been in smartphone usage to consume video. We are spending more than an hour and a half each week on average watching video content on a smartphone. And as it turns out, we are spending less time watching live TV than we are spending watching it through some alternate delivery. So what? What does this all mean? It means that as consumers continue to demand more control over delivery methods and timing of their television programing, it is the providers of live programing who are ultimately losing out. The question now is whether audiences will bite and watch those shows live, or whether “Peter Pan” will sit, recorded on a DVR until we are ready to watch. The key to keeping a competitive advantage in news is to think about milk. Yup, the white stuff at the supermarket. Here’s why: milk is a commodity. In economic terms, a commodity is something people will choose based purely on price. It is available from many different sources, and what is in the bottle is the same, regardless of what that source might be. Sadly, information can also be a commodity. And, for most information, the lowest price is free. So, how do you get people to pay a premium for a commodity? Let’s look at that dairy aisle to find out. Rise above the commodity level with unique, targeted content. 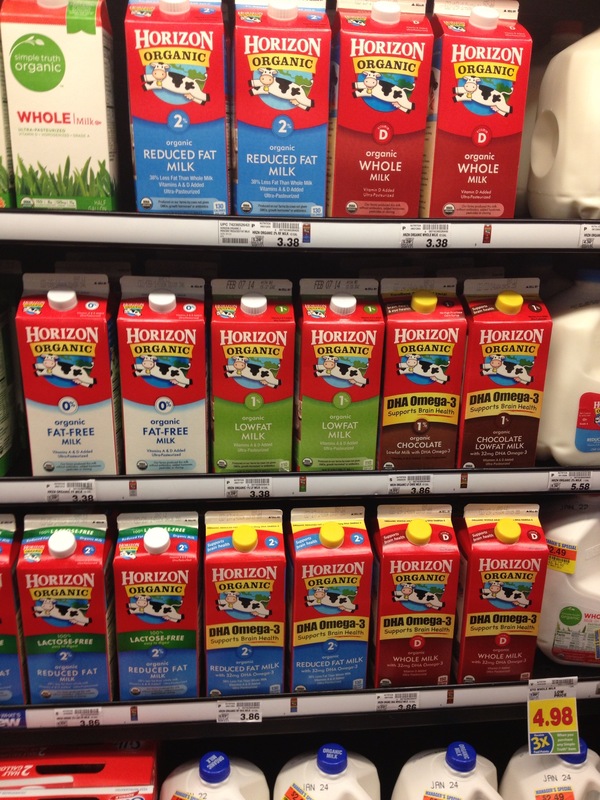 If you head to the grocery store and the one thing you were looking for was 2 percent milk, then when you walk up to that daunting wall-o-cow-juice, you will turn your eyes to one thing and one thing only – the price. If all you want is 2 percent milk, then you are not going to buy the expensive name brand with the pretty picture of the cow. You are going to buy milk, and you are going to buy it cheap. But there is a selection there at the dairy aisle. Surely it isn’t there as some obscure modern art piece. 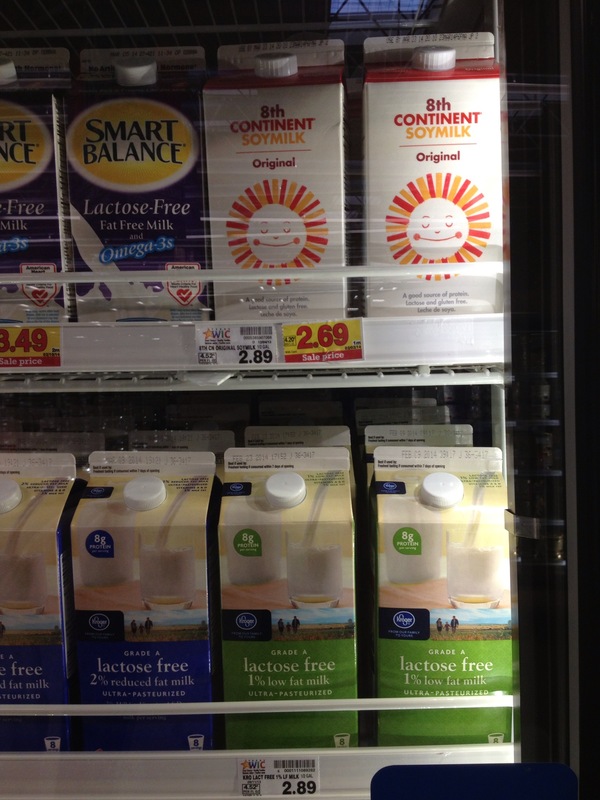 People must be buying all different kinds of milk in order to justify its spot on that oh-so-valuable grocery store shelf. How, then, can grocers ask you to pay different prices when you are essentially getting the same exact thing just in different bottles? The grocer does it by offering something that you can’t get in that generic bottle. In the case of the brand name, you are buying a story. You are buying image. You are buying status – even if it is just a status that you hold in your own mind. To you, the story that begins with you buying milk that is 20 percent more expensive ends with you being a better parent or a wealthy person, or however your version of the story goes. You pay for the best milk after all. The thing is, most people don’t care about THAT story. So, they grab the generic milk. But if you look closer at the milk aisle, there is more there. 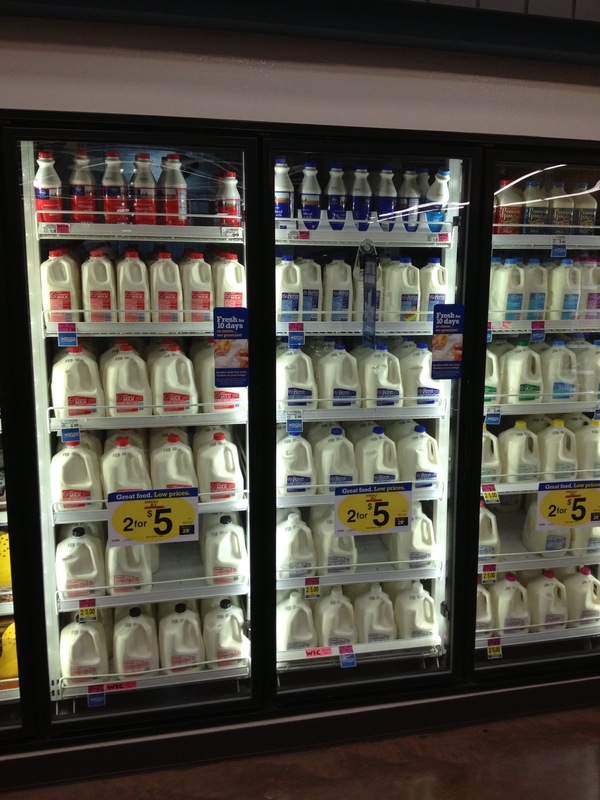 There are other tricks to get you to pay more for milk. 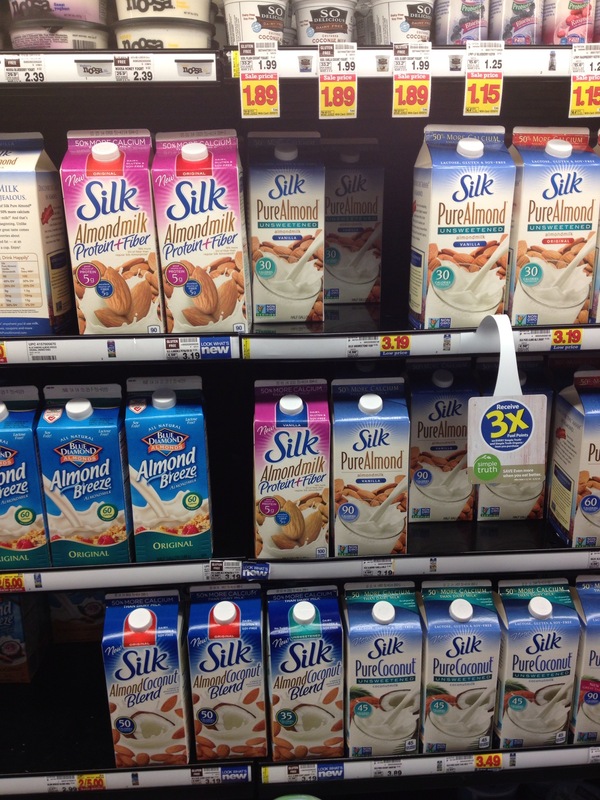 As you look up on the higher shelves, you see different kinds of milk that appeal to different people and that, most importantly, are not available in generic. You have soy and organic. But now even those are becoming commoditized. So, now you have almond and acidophilus, and even hyper local milk that fits into our new narrative about who we are. You even have other things that are made out of milk but are not the actual commodity – cheese, yogurt, whipping cream, butter. So, what does this have to do with news and the business of journalism? We need to learn how to take our product – news, information, entertainment and community reso urces – and we need to package them so we are not lumped in with the commodities of BuzzFeed and the click-bait digital sweatshops. We need to find new and different ways to tell our stories that may not be the traditional forms of news. What does news yogurt look like? We better find out if we want a future for our industry. We need to get up on that higher shelf. Information is only valuable if it is scarce – that is, rare and desired. Some news outlets can do this by being hyper local. Others do this by specializing in a niche area. Still others do it by commenting on the news with comedy, snark or pundit-fueled yelling. The bottom line is that the profitable news outlets are the ones that are reporting on news and information that they are able to create better than anyone else in the world. And they are also choosing to cover areas and topics that have interested and engaged audiences. Their product is not a commodity. It is scarce – rare and valued. They moved up onto the top shelf. Now they need to just figure out how to actually get paid. Where is the PR in the news media? One of the hypocrisies that always amazes me is how seldom media companies use public relations and advertising campaigns to promote themselves to potential audiences. Newspapers may be the worst, but by no means are they exempt. The sales teams from these media companies go out to businesses all across America and preach the gospel of promotion: “if you aren’t promoting yourself, then the next ad you run will be for your going out of business sale” was one of the favorite lines used by Kodi Wilson, one of the most gifted salespeople I have ever worked with. But when it comes time for media companies to promote themselves, the tactics they do choose are often sad, bordering on incompetent. TV stations dedicate unsold ad time for internal promotions. That’s great, but who is going to see these ads, if not people who have already chosen to watch? Newspapers preach the power of mass media, but then when it comes time to sell subscriptions what do they do, but telemarket and solicit one-on-one in public places, like grocery stores. The most progressive media companies serve as sponsors of events and festivals. And while that is great, we need our media companies to step up even beyond that. Media companies need to practice what they preach and start buying ad space to promote themselves to potential audience members who have not chosen them — and not just house ads in their own space. Those are worthless, because think about it, who is going to see them except for the audience they already have? They need to be doing proper media buys using proper media planning tactics. Newspapers need to begin reaching out to its audience members and explain to them why they still matter. Where are the ad campaigns about being good citizens and staying up to date with the community news? Where are the ad campaigns about civic engagement through reading? Where are the speaking tours talking about our relevance? If we don’t believe in ourselves enough to promote our products, then why should we be surprised when nobody believes in us either? Because, maybe that next ad we run will be our going out of business ad. Media companies would do well to do some soul searching about who their customers are. Why? Because knowing who your customer is helps focus your efforts and your mission. The easy and obvious answer is that, for a media company, the customer is the same thing as the audience. But allow me to be heretical for a second and propose this counter point: the audience is only truly the customer if the audience is paying directly for content. You see, there are two classic business definitions of “customer.” One would be the person who pays money for a service or product. The other would be the final consumer of a service or a product. But, guess what? Unless the audience is giving the media company money, they are not the customer according to either definition — instead the audience is the product. Sure, if you are a subscriber to a newspaper, then you are one of the customers. And if you are paying a cable company to access a news channel, again, this makes you a customer. BUT, if the audience isn’t paying directly for content, the content ceases to be the product and then becomes the raw material — the thing used to create the product … the audience. So, how is this useful? Because, in newsrooms across the country, we go out of our way to advocate for our audience, and this is a great thing — to a point. If our audience is paying for the content, then, by all means, give them all that they want. If our audience is not paying for the content, then we need to reevaluate why we are producing it. For example, if producing it and giving it out for free allows us to make money from another customer — namely advertisers — then terrific. But if the audience neither pays us directly, nor is an attractive target for advertisers, then it sounds harsh, but we should reconsider whether they are an audience worth cultivating. We should instead use our efforts to create content that attracts customers — paying customers. Now, as I said in the 4-D Funding Model, some content is not profitable but serves a higher mission. That content is still worth producing, but again, we need to find a customer for that content, and that customer is someone who will support our mission — namely donors and patrons. Making content that attracts customers is paramount. Without customers, profitable media cannot survive.